Eric’s Corners is pleased to announce the launch of their new web site. Eric’s Corner collaborated with the design and development team of Striking Web. 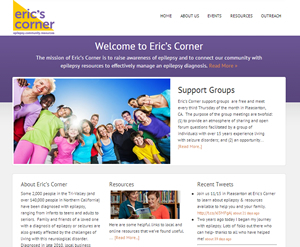 The mission of Eric’s Corner is to raise awareness of epilepsy and to connect the community with epilepsy resources to effectively manage an epilepsy diagnosis. Striking Web helps People First Productivity Solutions with new launch of website! People First Productivity Solutions (www.peoplefirstps.com) has recently undergone a revamp of its website. The new site features an easy to navigate menu and a new and fresh design. Too many organizations have spent too much time and money on incomplete solutions. Investments in training, organizational development, performance management, process improvements, and employee retention efforts often fail to deliver real and measurable results. As an executive with a Fortune 500 company, Deb Calvert, the founder and president of People First Productivity Solutions, was also challenged by the number of choices… and by the lack of sustainability those choices offered long-term. But there is a better way. Transformational change is possible. The key to real and lasting change is aligning your people with your processes so everything works together to advance your business goals. Alignment comes when you build organizational strength by putting people first. This is an approach that makes sense to everyone, from your front-line employees to your senior management team. And with everyone on-board, the changes we bring to you will soon become part of your organization’s culture. Additionally, internal ownership of these changes means that you won’t have to rely on an ongoing consulting engagement to “prop up” the transformation you desire. About 6 months ago, David Fraser approached Striking Web for help with his website www.heavenforbid.org . He was searching for a web design and development company that could help with website maintenance and further developing of his existing site. As I reviewed and learned about his website it became pretty evident that David had a vision for helping to provide instant access to vital information during emergencies. What I liked about his website is that you can securely store all your vital information in one place in an organized manner, making it easy to find in an emergency or if you simply forgot something. Because of his cause I’ve chosen Heavenforbid.org as the spot light website for this quarter.